Home » Destinations » Europe » Belgium » Are Your Stationed in Europe? Facing an OCONUS PCS? 30% Off Limited Time Pre-Sale Special! Order Your Pre-Sale Copy before February! 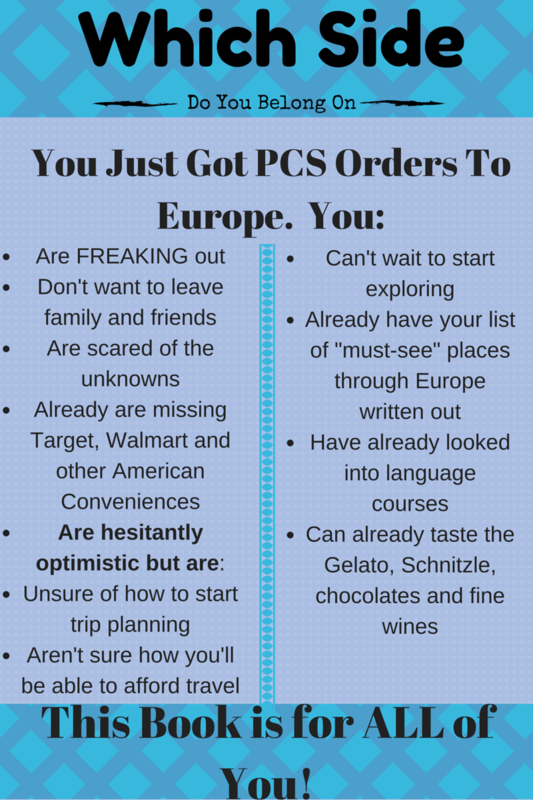 Are You (or someone you know) Facing an OCONUS PCS to Europe? Moving can be stressful. PCSing can be frustrating. But getting PCS orders halfway across the world? Well, that can be downright scary. Pre- Order NOW before the book is launched in February for 30% Off! Whether you want tips and advice on how to settle into your new home, want to learn how to plan a trip from start to finish or need help figuring out HOW to afford travel, this book is just for you. Including military-specific resources, discounts and travel options, it’s also the perfect toolkit for anyone stationed in Europe, whether you’ve been there a few days or a few years! While this book doesn’t apply to me as I am not in the military (nor married to someone who is) I think its a fantastic idea for one. I would imagine that getting stationed overseas is a somewhat unsettling experience if you are not prepared or interested in living abroad. I totally agree that however long you are stationed somewhere, you need to include travel! Looks like a great resource. Hope everyone is excited to get the chance to live abroad. It’s sad how many people get stationed here and “hate” it. They don’t even have an open mind before coming. That is exactly what this book addresses so that they can actually ENJOY and EMBRACE their time abroad! This will be a great help for many!! Had to ask my friend google what some of the acronyms meant, but this is a most helpful guide for military folk and probably some great pointers for most who are considering a move to Europe too. Haha! It’s true! There are so many ridiculous acronyms in the military! I actually purposefully included them so that the military community knew this book was perfect for them! Especially in a military community, it’s not nearly as scary to live overseas because there’s so much support around you. It can be a great experience! This looks like some great advice for military members who are moving to Europe. Sounds like it has some great tips. I would love to be based in Europe for a while! 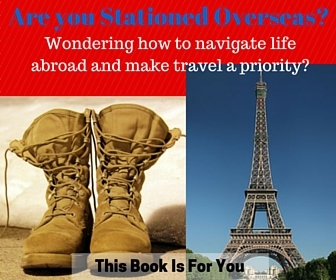 I’m not in the military, so this book doesn’t really apply to me, but I can imagine it would be a great resource for those who are set to be stationed abroad. It can always be hard to move, especially for those that would rather stay close to home. If I come across anyone who gets orders to be stationed in Europe I will have to show them this!